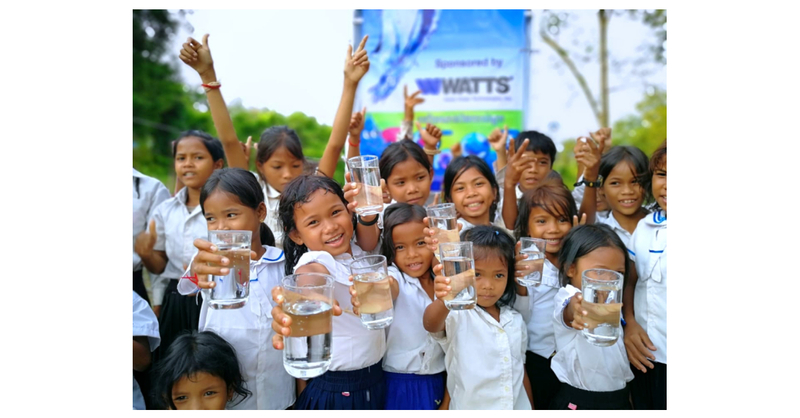 NORTH ANDOVER, Mass.–(BUSINESS WIRE)–Watts Water Technologies, Inc. (NYSE: WTS) – a leading global manufacturer of plumbing, heating, and water quality products and solutions – will fund and help install two water filtration systems to provide clean drinking water for children and families in need in Siem Reap Province, Cambodia. Watts Water Technologies, Inc., through its family of companies, is a global manufacturer headquartered in the USA that provides one of the broadest plumbing, heating, and water quality product lines in the world. Watts Water companies and brands offer innovative plumbing, heating, and water quality solutions for residential, commercial, and industrial applications. The company employs 4,800 people in more than 50 offices across 24 countries. For more information, visit www.wattswater.com. Planet Water Foundation is a non-profit organization focused on bringing clean water to the world’s most impoverished communities through the installation of community-based water filtration systems (AquaTowers) and the deployment of hygiene education programs. Planet Water Foundation projects are focused on children, schools, and rural/peri-urban communities across Asia and Latin America. Since 2009, Planet Water has deployed 1,000 projects that provide clean water access to one million people across 14 countries through strategic partnerships with organizations such as Xylem, JP Morgan, Coca-Cola, Columbia Sportswear, Expedia, Starbucks, and Watts Water Technologies, among others. For more information, visit us at www.planet-water.org.